Balansio provides the tools for health care professionals to treat, guide, support and motivate patients - not just based on glucose data, but based on rich self-care data enabling more accurate and better care. With the current resources it is hard to provide individualized and need-based care for all diabetic patients. Balansio has been developed to remove this challenge by using automated clinical intelligence and algorithms to minimize routine work so that the clinician's expertise can be directed to the patients demanding more specific help and support. Balansio enables you to provide timely care and support for your patients. Balansio utilizes automation that simplifies your routines, helps you to prioritize your work and gives daily support for your patients. Balansio follows your patients' self-care, acknowledges positive achievements and identifies challenges and areas for improvement. Balansio highlights found issues, suggests possible causes and prompts ways to improve. As a health care professional, you can enable these finding for your patient through their Care Plan. This enables the patient to focus, learn and improve. Balansio removes the need for calendar-based routine appointments. This saves a lot of time and enables you to focus on the patients who really need help right now. Balansio helps you by listing your patients in priority order and enables you to see which of your patients need your attention now. When changing into a patient-centric and need-based care model - Balansio care model - patients are invited to an appointment only when really needed. 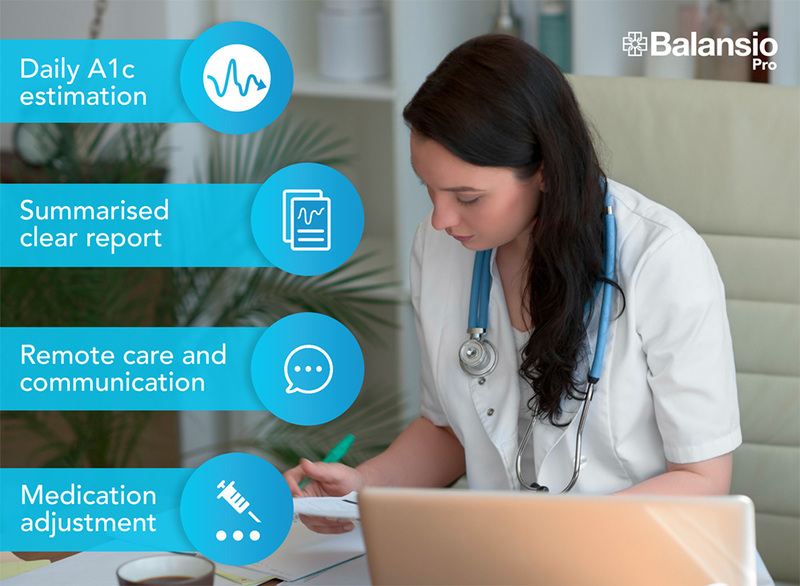 With the help of Balansio's care automation, you can communicate with your patients directly and focus on helping them to cope with individual challenges and learn how to manage them in the future. For help and support, Balansio's automated clinical intelligence analyzes the self-care data of each patient. 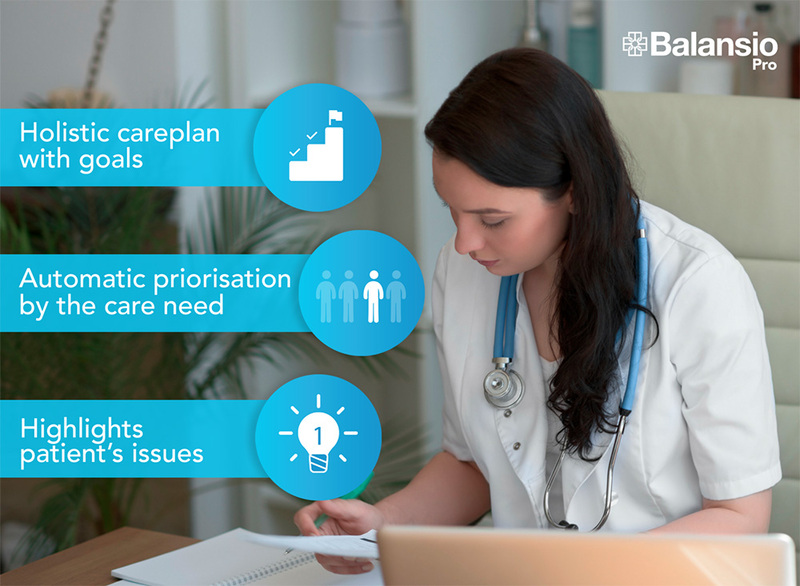 Based on the findings, Balansio helps both the patient and the professional to identify challenges, understand their potential root causes and learn how to change the routines affecting the patient's care balance. Based on the findings you as a professional can communicate with the patient trough Balansio's secure and encrypted messaging channel. For the first time, it is possible to get ongoing feedback on the patient's care routines and especially the effects of changes made to improve. The value of A1c estimation is increased when it is shown against the other care data illustrating routines and patterns resulting in changes in the patient's A1c. The estimation is calculated based on daily glucose measurements and adapted individually by using the patient's HbA1c laboratory tests. This unique algorithm can estimate the HbA1c value for the patient on accuracy similar to HbA1c laboratory test devices. Learn more about the accuracy of our A1c Estimator from here. According to an international DCCT study* 1%-point decrease in HbA1c level reduces patient's risk for complications up to 40%. As an example, in the picture above, a middle-aged male with type 2 diabetes on MDI treatment was able to make significant changes to his lifestyle routines. With the help of Balansio system and a professional diabetes nurse, he was able to change his eating habits. On the picture (starting on day 110) you can see rapid improvement in the patient's estimated A1c during the following 50 days. In practice, the patient started to eat breakfast every morning, which resulted him to become hungry at lunch time and to have a reasonable dinner in the evening. As a result, the patient was able to sustainably lower his HbA1c level by 1% and to have significantly lower risk to have diabetes-related complications. The continuous visibility to his estimated A1c and positive feedback both from Balansio and his diabetes nurse while making changes to his lifestyle routines, motivated him to keep up the good work.